Leo Combat was founded in 2013 with the express purpose of developing and making products that would enhance the safety of our Law Enforcement Officers (LEO) as well as citizens who carry concealed. Below are some of the things you can expect from us soon…and there are many more that you don’t see here. We greatly appreciate the interest in our company, and look forward to serving you in the future. Based on an idea I thought up and executed in 2010-11, with the goal of combining texture for secure grip with comfort for IWB carry. Also, they look cool! This was supposed to be my first product, back in 2013. And there are 10 of you out there who expected me to deliver two years ago, and I didn’t! I feel really bad about that but it turned out to be harder and more expensive than I anticipated. I am finally arriving at a point where I think I can get a production run completed. There is more work to be done yet but I feel good about it. Follow the progress by reading The Cool Grips Project on the blog, and you’ll know when they’re ready! UPDATE: Lawsuit is filed. Watch for updates here, and buy a gift certificate if you want to help out! 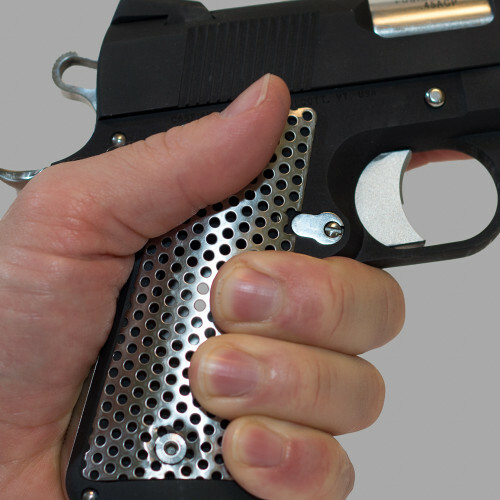 As discussed on the blog, the world needs a lightweight 1911 that you can take to the range without fear of damage from hollow points or powerful self-defense loads. 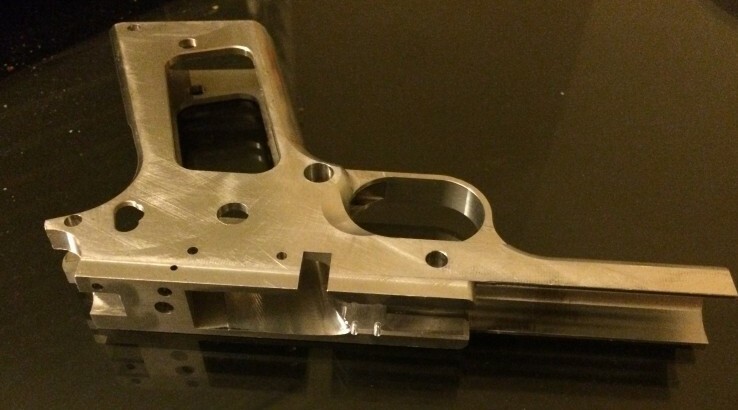 So that’s what is happening in the Leo Combat Mad Scientist Lab: creation of a steel-reinforced 1911 frame. The FFL is here at last. Look for frames first, and complete commander-size carry pieces shortly thereafter. Now, why is work held up? Well, the State Department’s ITAR regs (based on the Arms Export Control Act) requires all manufacturers of “defense articles” (which includes most guns) to register at the astonishing cost of $2,250 annually. Note that a manufacturing FFL costs only $150 for THREE YEARS. Why is the State Department involved at all? Well, they issue export licenses, so that hopefully nobody will be exporting guns and missiles to ISIS or Iran. Which is all well and good, except that…I DON’T EXPORT ANYTHING! So why the outrageous fee merely to put a company name on a list which will never export and requires nothing from the export control people? That’s a serious question. You can register as a customer at this very website at no cost–and it requires about the same amount of information that export compliance registration requires. It costs them nearly nothing to put a name and address on a list. But they charge so much that, realistically, I’d have to sell 20 guns at wholesale just pay their fee–assuming that those 20 guns sold with no marketing costs whatsoever. I am trying to get them to call me back (3 weeks and counting) and I have asked my Congressional reps for help (we’ll see if that works) but as a last resort, I may sue on several legal theories: 1) because the AECA is predicated on Congress’ foreign commerce power, it can’t reach a purely domestic company, 2) the delegation of the fee-setting power to State without any constraints or guidelines is excessive delegation and void, and 3) that the fee impairs the right to keep and bear arms by being unreasonably high and not rationally related to the (admittedly legitimate) government purpose of preventing the sale of guns to terrorists. Will any of these win? I don’t know. But I can’t afford it otherwise, so I rather hope so. You know who else is required to register? Your favorite 80% frames maker. Yep, they don’t need FFLs, but they’re making precursor parts, so State wants them to pay. Plus makers of all manner of gun parts (barrels, trigger mechanisms), accessories, and ammunition. There are a lot of non-compliant companies out there, I’m guessing, and that means that a hostile administration can make our lives miserable and attack the Second Amendment without any new laws at all. All they need to do is crank that fee up even higher and start enforcing it. If I sue, I may ask for your donations to help pay for it and keep the lights on while I focus on the lawsuit instead of churning out more products for you. It’s a huge waste but a win would mean the Feds have one less tool to attack our rights with, so it would be worth it. Want the latest news on new products? CLICK HERE to join our newsletter!